A skyscraper in the center of St. Petersburg? Why we say NO. This article from the section «Archive: Okhta-center», dedicated to the history of the civil resistance against the construction of a skyscraper on the Okhta cape in St.-Petersburg. As forward-thinking citizens, we realize that it is in our city’s best interests to develop and thrive economically. However, we are not willing to sacrifice its world-famous landscape in order for such development to occur. We would like our city to develop, but not at any cost. Demolition should not be mislabeled “development”. The so-called “Okhta Center” skyscraper that is currently being planned near the famous Smolny Cathedral by Gazprom (the largest Russian gas and oil company) will not only deface the landscape of St. Petersburg, it will impact its historical center and create a dangerous precedent for disregard of its laws. There are three main reasons why we oppose this construction. Most of St. Petersburg’s structures were built within a span of less than two centuries. Unlike the cultural “mosaic” found in such cities as Moscow or London, our historical center can be perceived as one entity, and as such it was included in the UNECSO World Heritage List. The construction of a skyscraper 403 meters tall (three times higher than the symbol of our city, the spire on St. Peter and Paul Cathedral) on the bank of the Neva River will be a degradation of St. Petersburg as an architectural ensemble. Such an enormous skyscraper would be seen from many streets and angles, and would destroy the style and composition of the city’s most important public spaces. It will also negatively impact the skyline and the city’s “silhouette”. The effect would be similar to having a modern steel-and-glass structure built on every street. 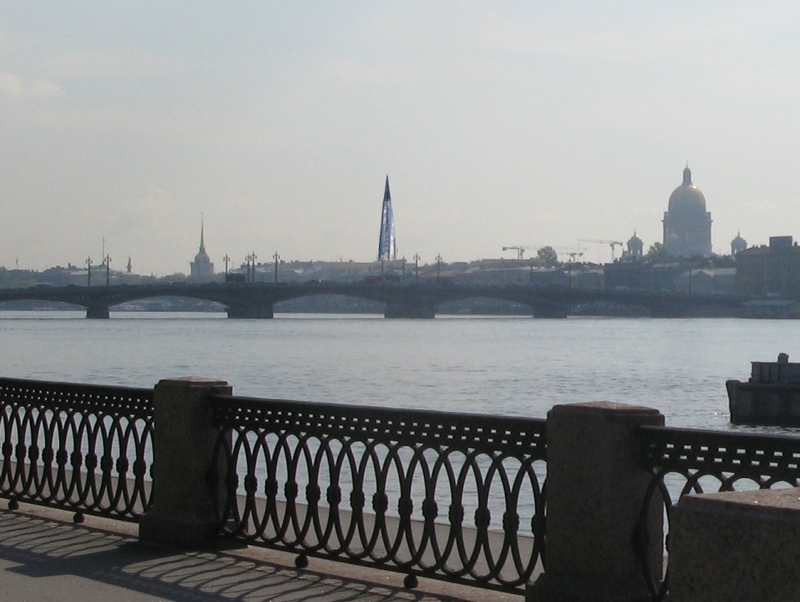 Many models have already been made to demonstrate the visual effect of this skyscraper on St. Petersburg. They clearly illustrate how the Gazprom tower will dominate the city and negatively effect all of its historical vistas. One of them was even produced at the request of the developers themselves and was presented to the St. Petersburg City Government. But despite the fact that all such models have clearly shown how the tower would be visible from many areas of the city — including all of its principle squares and its historical center — the City Government still gave the builders permission to exceed the authorized height limit for its neighborhood (forty-eight meters) eight-fold! We used to think that St. Petersburg was approximately 300 years old. However, recent archeological research in the Okhta River estuary (the proposed site for the Gazprom tower) produced unexpected results. This location contains the remnants of three fortresses – the Swedish Nienschanz (17th century) and Landskrona Forts (13th century), the latter of which includes a four-meter high wooden tower. Archeologists also unearthed a medieval Russian town of the 12-13th centuries there. All of these historical sites should be preserved, and in any case, they must be studied very thoroughly. Archeologists also found the remains of an ancient settlement located on the same site as the fortresses, which is between five and seven thousand years old and can be dated from the 5th to 3rd millennia BC. Today approximately one third of the building site has not yet been examined. The other two thirds contain parts of the aforementioned fortresses. The archaeologists who made this extremely important discovery refused to sign a statement that the site does not contain anything of historical value or material evidence of our ancient heritage. After they refused, the developer fired them and hired new archeologists whose task is to simply clear the site so that construction can begin as soon as possible. A huge underground parking lot will take the place of the ancient fortresses. The skyscraper’s foundation will be thirty meters deep, and will destroy the only evidence that can tell us more about the medieval period of our city’s history. Whether or not to build such a skyscraper is not a matter of taste, it’s a matter of law. This project violates two Russian federal laws and two local laws. More importantly, it also violates the World Heritage Convention, which Russian authorities tend to ignore. If this skyscraper is built, it will set an important legal precedent. There is no doubt that such an action will signal the beginning of a process that will ultimately lead to the destruction of the historical center of St. Petersburg. Such an outrageous subversion of the law in favor of big money would definitely be the first — but not the last – time something like this has been allowed here. If allowed, it would be followed by similar actions and appeals by dozens of other developers. In just a few years we stand to lose not only the physical remnants of our ancient past but also the beauty of a unique and beloved city which has inspired countless artists, writers, musicians, and philosophers. You can help us now.